When did campaigns raise the money? Campaigns are required to report to the FEC information on donations made by contributors who have given them more than $200 in total, though campaigns can choose to release this information about all their donors. This information includes the name, address, and employer of each donation as well as the date and amount of each donation. Since the Republican candidates have been jockeying for position, when they raised the money matters. If candidates raised a lot of money shortly after they first announced, but have had their fundraising collapse since, the total amount of money may not be the best indicator of future viability. Where did campaigns raise the money? Money can be raised nationally, but state-level activist support matters for winning early primaries. To that end, how many donors (at least of those who have given more than $200) live in early primary states? As a side benefit, this type of reporting might encourage campaigns to release itemized donation information for donors who give less than $200, which would be good for both reporters and political scientists. Who is competing with whom for donors? Unlike voters, individuals can donate to more than one candidate in the race. By seeing which candidates share donors — and when these itemized donors gave how much to whom — we can better see which candidates have overlapping bases of support and who is winning this competition over donors. An even more sophisticated analysis of overlapping donors can be used to estimate donor and candidate ideology, but as a first cut it would be helpful to see which large donors have given to multiple campaigns. How much is going into “independent” PACs? A relatively new development in campaign finance is the emergence of technically independent Super PACs that make expenditures to support only one candidate. Mitt Romney, for example, is supported by Restore Our Future, Inc, a Super PAC formed by Romney supporters. While such organizations cannot coordinate political activity, the way they are being funded makes it appear that they are becoming de facto arms of the campaign. For example, Romney has appeared at a Restore Our Future fundraiser. Any estimation of fundraising support for the Republican presidential candidates must include these independent PACs. What is the right comparison? The New York Times has already featured flawed campaign finance reporting claiming that Obama hasn’t gotten the same support from small donors he got last time. However, this compares all of Obama’s fundraising in the 2007-2008 cycle to a fraction of the time period. Moreover, incumbent presidents have more capability to raise large dollars from access-seeking interests than do challengers. More still, in the last cycle Obama was fighting through both a hotly contested primary and a general election, whereas now he neither has a primary challenger nor (yet) a clear Republican opponent. My research indicates that negative messages about the opposition raise funds, and as such we can reasonably expect small donor fundraising to pick up once Obama has a clear opponent whom he can attack. But this is just one example of the way that campaign finance reporting can get things wrong when it picks the wrong counterfactual against which to make comparisons. Clearly, for the Republicans comparisons to their immediate competitors for the nomination are relevant, but since not all have been raising money for the same amount of time, even those comparisons should be made with caution. Which messages in campaign ads raise money? Which messages from which messengers mobilize campaign contributions? This is the question I tackle in my latest working paper. To answer it, I constructed a time-series cross-section dataset that matched advertising data from the Wisconsin Advertising Project in 2004 to data on individual campaign contributions from the Federal Election Commission by county and day. In order to minimize concerns about omitted variable bias, I limit my study to non-battleground states and include both day and county fixed effects. Only the positive ads that explicitly mention partisan identity generate contributions to the campaigns that air them. Furthermore, these ads’ impact on giving is greater where the underlying partisanship of the county is more favorable, an interaction that is substantively weaker for ads that do not mention partisan identity. 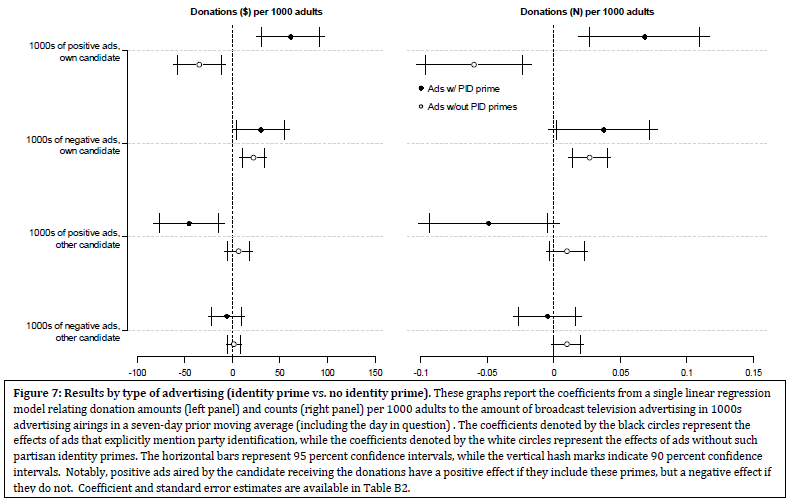 Positive ads only decrease donations to the opposition candidate if they focus on the personal characteristics of the favored candidate, making them more identifiable to the audience. There is some (small) evidence of a backlash, where negative ads raise money for the target of the attack. I conclude that partisan identities strongly frame the way that potential donors respond to political messages. Importantly, these findings are consistent with other recent work on campaign contributions, such as Adam Bonica’s finding that Joe Wilson’s “You Lie” comment during the 2010 State of the Union both raised money for Wilson and Wilson’s opponent, and that these donors were more ideological extreme than earlier Wilson donors. I’ve also updated my earlier paper on using the effect of advertising on giving evaluated with the broadcast advertising experiment conducted with Rick Perry’s 2006 gubernatorial campaign. Thanks to all who contributed helpful feedback. Also, since Rick Perry is now running for President, his campaign has put online all of his old ads, including the one used in the experiment which you can now view on YouTube here. Newly announced Republican presidential contender Rick Perry has taken some flack for the substantial fundraising he has done among executives of major Texas corporations whom also benefit from public policy he supported. Matt Yglesias rightly points out that it would be unfair to infer from this observation that Perry is corrupt. After all, every politician favors certain public policies, and others who also support those public policies will sometimes contribute to help get that politician into or stay in office. But do potential donors actually respond to politician’s messages? Do they respond to Rick Perry’s? In a word, yes. My recent working paper sheds light on this very issue, in fact looking at Rick Perry’s messages and donors, taking advantage of a randomized controlled trial, the gold standard for causal inference. During Perry’s 2006 gubernatorial campaign, Texans for Rick Perry invited in political scientists to conduct field experiments to test the effectiveness of a variety of aspects in his campaign. In research from this set of experiments, published earlier this year in the APSR, Gerber, Gimpel, Green, and Shaw (gated) show that one of Perry’s advertisements, broadcast on television and radio in January 2006, was indeed effective at persuading voters, but that this effect was very short lived. Matching the randomized schedule of this advertising (included in the paper) to Texas campaign finance records by county (or media market) and week, I find that that radio and television ads also increased the donation rates and donation amounts, as documented in the figure from the paper reproduced below. The full working paper can be found here, where I go into greater depth about who responds to these messages with donations (feedback would be most welcome). Of course, this is just one advertisement in one month in one election campaign. Whether it was the positive tone of the Perry ad or the specific policies cited that generated this support among donors, I cannot say. However, my 2011 APSA paper looks at the effect of advertising tone and policy content on campaign donations in the context of presidential elections, so more will be coming soon on those questions. While there have been a handful of cases of corrupt officials, those cases generally involve payments outside of campaign donations. There’s generally little evidence to suggest that campaign donations influence lawmakers to support policies they would not have preferred otherwise, especially as legislator positions have become increasingly homogeneous within parties. For certain, wealthy citizens have a disproportionate impact on American public policy. However, to the extent that this influence is the result of campaign contributions, it is much more likely achieved by helping favored campaigns bear the costs involved with winning elections than it is by buying specific favors from elected officials. In short, the fact that Rick Perry has been successful at fundraising is better evidence of his effectiveness at pursuing and communicating his agenda — one admired by his donors, who can contribute unlimited amounts under Texas law — than of any corruption. Welcome to my new blog. I plan to use this space to post occasional musings on political science and politics, particularly when those musings relate to my own research and don’t fit into 140 characters. Thanks for stopping by!